SAVE $90 - ENROLL FOR $335! The following are a few reviews from students that have completed their 120 hour education requirement through Agent Professor to become a licensed Utah real estate agent. Agent Professor was great! The information and training provided was well organized, easy to follow and definitely gave me a greater understanding of what being a real estate agent is all about. It's the perfect way to start your successful real estate career! I really learned a lot about Real Estate through this course. It really goes in depth and provides you the knowledge you will need to be a successful Real Estate agent. This online class was great. I was given all of the tools that I needed to be successful. I got through the class in about 3 months and it was great. I would highly recommend anyone considering Agent Professor. Agent Professor was easy to follow with fun and engaging activities to break up the routine. This program is very convenient. If you're a self starter and motivated-- do it. It's at your leisure, on the computer ... and very quick to accomplish if you just put the time in. I am happy with the decision I made to enroll with Agent Professor. I looked at a lot of other online courses and ultimately decided this was the best option and I still believe that to be the case. I recommend Agent Professor to anyone thinking about studying for their real estate license. I found agent professor's program to be adequate to pass the 120 hours in a month so I could accomplish the State exam and get on with being licensed to sell real estate in this state. Easy and straightforward, Agent Professor presented the critical information I need to know to pass my State Exam in an easy-to-understand format that allowed me to go at my pace. Thanks Agent Professor! This program was amazing! I love the quizzes and the depth of the class. I thought that the course material was very in depth. I have a couple buddies that recently went through another course and have had a struggle with the state exam. I feel that this course offered a different perspective that their coursework did not. I think that the professional questions we asked throughout the course helped me gain a lot of knowledge I simply could not gain from just reading. I thought the course flowed well and gave me the opportunity throughout the course to reach out to professionals in the field to continually get real life experiences. The class was set up nicely to take on my own time and schedule, I feel like I am ready to take the exam and pass it the first time! Agent Professor was a great way to go about getting my Real Estate licensing education. I was able to do it from home or work and around my own schedule. If there was ever a question or concern they got back to me right way. I would recommend Agent Professor to my friends and family. 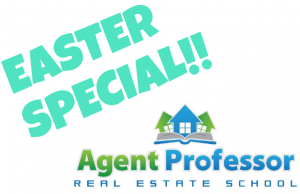 Agent Professor is a fantastic way to get your real estate license. The program is well written and easy to navigate. I learned so much through their interactive lessons and blogging. I made some connections to real estate agents in my area. I would highly recommend it to anyone who wants to become an agent. I was greatly surprised by the course I thought it might be kind of boring , but found it to be interesting. I took the course in about 3 weeks while working and it was easy to understand and navigate through the site. My favorite part of the course were the tests and quizzes. I would recommend this course to anyone. Great course to help one get the required 120 hours in an online class. Very easy to navigate...Easy to learn with good practice tests in between...Very glitch free...Been great. I was a broker for over 14 years and let my license go and when I had to do it over I was hesitant. The Agent Professor website made it easy, flexible and streamlined and made the experience much more enjoyable than it was before. I loved how convenient this program was for me. I was able to do it on my own time from wherever I was. Helpful activities made the material easy to remember and kept me engaged. I highly recommend this course to anyone who is looking to get their real estate license! I loved that I could do the program at my own pace. It was easy to pick-up where I left off. Agent Professor puts the power in your hands! The interface is very intuitive and allows the user to move as quickly or slowly as they want through the material. I have had a good experience in doing this course..thank you. If you are interested in joining the ranks of Agent Professor graduates and start selling real estate feel free to Register Today or Contact Us with any questions you have regarding our real estate school or Utah real estate licensing.